I'll forgo any apologies for my absence because, well, I just moved across the country and we've only had internet for a couple of days. So here I am. IN HOUSTON. On my old couch in my new apartment. Blogging. I admit I've been avoiding the blog a little. There's something about updating you that really pushes us irrevocably into this new chapter in life - and that's a little scary to me. The past two weeks have been a flurry of flying and driving and packing and apartment searching and unpacking and seeing old friends and meeting new people and finding new furniture and updating our address and tying up loose end after loose end, and so I've mostly been in motion. I've spent no time in reflection. But last weekend we were walking into the grocery store (for the eighth time in four days) and I got a text that my dear friend in Los Angeles had just delivered her third baby (and first girl!) at home before they could get to the hospital. Everyone was fine, and the text had a picture of my friend's glowing face as she was being loaded up in the ambulance. I sat down in the middle of the parking lot and started crying. Jacob stood there patiently holding our shoeless two year old on that muggy evening as I overdramatically began to mourn the life we left in Los Angeles. I've been waiting to move closer to my family in Texas ever since I moved to LA five years ago. I didn't have a lot of emotion surrounding the move: the oven timer had dinged, and it was time to move home. I knew after I moved I would realize that California had been a home too. And now my days - though mostly spent fixated on the to do list - are peppered with moments of loss as I remember yet another face that I won't being seeing any time soon. All you California friends, you were good to us and we will miss your dear hearts. But that's all the sentimentality I have time for today because I must now return to the never ending job of teaching a toddler that in Texas we have to close the door to the porch. 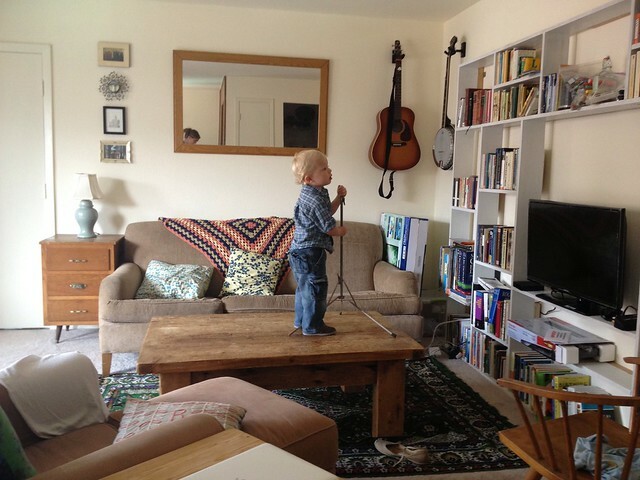 And for good measure, here is a picture of what I came across said toddler doing today after he dug out Jacob's old music stand from a packing box. Rocking some Twinkle Twinkle like a diva. Happy Sunday, friends! Be back sooner than last time I promise! Geez. We just moved down the street. I do not want to even think about a cross country move. More power to you (and welcome back to Texas!). It's been over a year since our cross country move, and I'm JUST NOW realizing what we left. I've been so relieved to be near my family again, I didn't properly mourn what we left, but restlessness has set in (as it always does for me) and now I'm experiencing some of those same emotions you're talking about. Coincidentally, I wrote about it today, too. Something about Sunday evening just makes the wistful king of writing flow! I can totally sympathize with the emotional upheaval of moving. I hope soon the joy of being near family will outweigh the pain of everything you left behind. Love the Twinkle Twinkle concert picture. Glad to have you back online. Missed you! Welcome back to the South! If you want to take a jaunt to Louisiana, we are about 4 hours from you and would love to see you. We have sleeping bags and a couch! Glad the move went well - I've been missing your posts!! I agree with Meg! Holla to the Super Mama in Houston. We miss you and love you guys!